Imagine this: You just applied for your first credit card and it’s deemed for individuals with “excellent” credit. You have no idea what your credit score is but you went through with the application because you believe you are an excellent candidate. You’re excited to receive the application back with the hopes for a new line of credit. What you don’t know is the chance of your application being rejected is high. Like higher than the chance of Rocky Balboa always winning the “big fight” at the end of every one of his five movies. All jokes and side jabs about the Rocky franchise aside, without a credit history, you aren’t going to be accepted for credit cards targeted for those with “excellent” credit. Why? Credit grantors don’t know what level of risk you are to their company. Are you going to consistently pay back the money they lend you or take it and flee to Mexico? What is it? This type of credit allows you to make charges up to a maximum credit limit you are granted to borrow. Just like the earth revolves around the sun, whatever balances remain on your statement sheet at the end of each month will come back around until you pay them off. As you pay off your balance, with interest, more of your credit limit becomes available to use again. What is it? This type of credit allows you to make charges up to a maximum limit, like revolving credit, but you must pay back the balance in full. If you don’t, then you pay a hefty, and I mean hefty, fee. What is it? This type of credit is used when a customer is asking for a lump sum or a fixed amount of money. The customer then pays back this amount in installments with accruing interest. An installment is a sum of money due as one of several equal payments for something, spread over an agreed period of time. Think auto loans and mortgages. What is it? This type of credit is used when a customer takes possession of property or utilizes services today and then pays for it later. Think cell phone bills, Netflix, and utility bills. Each of the above types of credit helps you build trust with creditors while enabling you to live a better life. 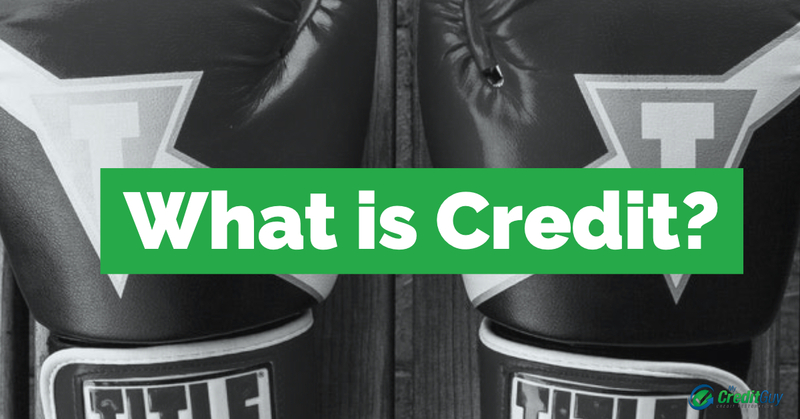 Just like Rocky observing his opponent in the boxing ring, creditors analyze your every financial move. Creditors review your level of risk by analyzing your credit score. The higher the score, the more money you are allowed to borrow and the better options you have for interest rates. Why? You’re considered to be less of a risk to creditors. But if you make a mistake, even just one late payment on a credit score, your risk to credit increases. Overall, successful matches in the ring, and in life, are won by training for them. If you want that amazing credit card or killer interest rate for an auto loan, then you have to start at the beginning. If you have questions about the definition of credit or want to know more about credit scores, ask me questions here.